It's that time of year again. When bikers from all over the globe converge on the town of Sturgis, South Dakota, for the largest biker rally in the world. To some, this is a mission field, an opportunity to witness for Christ and spread the Gospel - especially among the notorious 1%'s. If you think you have a tough audience, imagine if you were witnessing to the leaders of the "Hell's Angels", "Mongols", "Pagans", "Outlaws" and other Biker Clubs. It takes a special breed to fulfill such a calling, and Rey Perez, is one such individual. He has traveled over 350,000 miles doing Biker Ministry - taking the Gospel to the least, the last, and the lost. Before that, he traveled the world with Nicky Cruz, as one of the band members for his Crusades. Once again, he is heading out, seeking divine appointments, grace, power, and protection - as he crosses several states to witness at Sturgis. Won't you take a moment to pray for him, and the success of his Ministry? Rey has a smokin' hot Latin Gospel album called "The Road Warrior". It even includes a track called "Sonny" written especially for Sonny Barger - the founder of the "Hell's Angels". 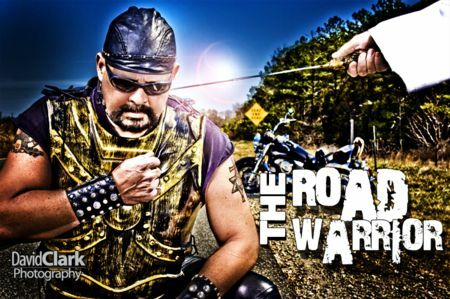 He has a 20 minute Biker Ministry video titled Dead End Road, which dramatizes the eternal consequences of our choices (through the lives of two bikers who are on different paths). He also distributes Gospel tracts, and has one on one conversations (he calls divine appointments), with some of the top people in the biker world. If you would like to know more about his extraordinary Ministry, read this interview in Divine Inspirations Magazine. It's a view into the heart of a warrior for God - don't miss it. Personally, I have been so impressed by his life and Ministry, that it inspired me to write a song and produce a music video called The Biker Blues. He also inspired the Biker Heaven Internet Ministry, which has a social group you can join. Please pray that souls will be won, and Christ will be uplifted. Pray that Rey's Ministry will serve as a light in a dark place, as he once again takes the Gospel to Sturgis this year.